Taking immediate action is vital to minimizing further damage to your property. You can count on Incredible Restorations 24 hours a day, 365 days a year to professionally clean up water in your property . Water damage in your home can be caused by broken sewer lines and toilet backups, sump pump and water heater failures, broken pipes, washing machine and dishwasher leaks, ice maker leaks, heavy rain roof leaks, ground water seeping into the basement and natural disasters. Once all visible surface water has been removed, proper drying techniques must be applied in order to adequately dry the structure and property. Although not always visible by the naked eye, excess moisture can hide in your floor coverings, foundation, wood structures and walls, causing further damage to your property and can create the right environment for mold growth. Thus it is important to have professionals assess and address any water damage in your property; water is to be removed and the structure property dried, ventilated and disinfected as quickly as possible in order to prevent future damage and reduce any form of microbial growth. Our water damage restoration experts are knowledgeable trained certified professionals. Each technician has received their WRT (Water Restoration Technician) certification from the Institute of Inspection Cleaning and Restoration Certification (IICRC) and performs water restoration techniques in compliance with the IICRC S500 standards for professional water damage restoration. All Incredible technicians are fully equipped with state-of-the art water extraction, drying and moisture testing equipment prepared for all types of flood damage scenarios. 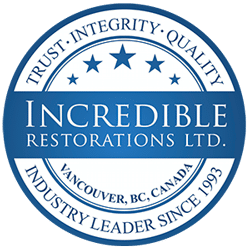 Since 1993, Incredible Restorations has been solving water damage problems in homes and commercial properties, maintaining a pristine reputation in the lower mainland for professionalism, quality, and customer service. With Incredible Restorations, you can rest assured that your property is receiving the highest level of workmanship available, as we know maintaining your property’s value is important to you. Please feel free to contact us anytime if you have any restoration questions regarding your property and we will happily assist you.